Home news IMMIGRATION DEAL: TRUMP 'I'D LOVE TO SEE A SHUTDOWN' IF DEMOCRATS DON'T AGREE TO WALL. IMMIGRATION DEAL: TRUMP 'I'D LOVE TO SEE A SHUTDOWN' IF DEMOCRATS DON'T AGREE TO WALL. 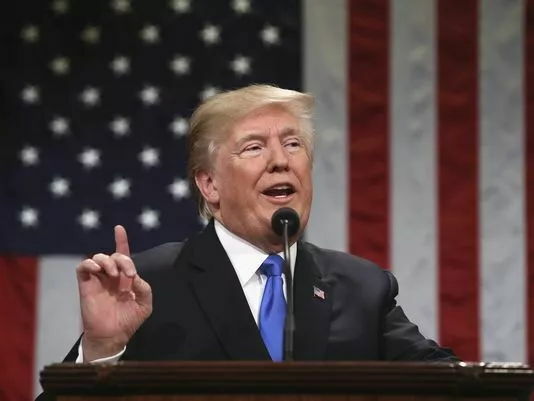 President Donald Trump said he's willing to see another government shutdown if Democrats don't agree with his immigration framework, including funding for a U.S.-Mexico border wall and limits to family-based immigration. Trump repeatedly attacked Democrats during the discussion, accusing them of endangering the country. He also jabbed current immigration laws saying that "not another country in the world has the stupidity of laws that we have when it comes to immigration." The meeting included five Republican legislators, including U.S. Rep. Martha McSally, who talked about a bill she sponsored that meets Trump's criteria to fix immigration in exchange for legalized status for "dreamers" — the undocumented migrants brought to the U.S. as children. Before Trump delivered his State of the Union address, the White House issued three demands related to immigration in exchange for its support of a path to citizenship for 1.8 million dreamers, including 800,000 protected from deportation under the Deferred Action for Childhood Arrivals, or DACA. Trump is asking for $25 billion for a U.S.-Mexico border wall system, and end to the diversity visa lottery program, a reduction in family-based immigration.